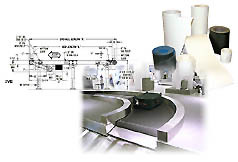 VIS conveyor belts are used in all kinds of industries and applications. Our Urethane food belts have excellent resistance to fats, vegetable, animal and mineral oils, as well as cleaning chemicals. Our general purpose conveyor belts have superior abrasion resistant covers that are available with high or low friction covers. In addition, our assortment also includes high performance conveyor belts for the metal stamping, wood, material handling, airport, paper converting and other industries. High strength yet flexible tension members of VIS conveyor belts reduce pulley diameter and take-up requirements and give our belts dimensional stability under varying loads. This results in improved belt tracking behavior and reduces overall maintenance requirements. High friction covers of certain conveyor belt styles provide aggressive grabbing power for steep inclines and high product acceleration; other covers are designed with low friction surfaces to allow product accumulation, side loading and product diverting. Abrasion resistant compounds lead to long belt life. Many of our belts are engineered to provide high oil and chemical resistance, allowing you to apply them in adverse conditions. Superior splicing technology makes our belts very reliable and trouble free, giving our customers a high degree of confidence in using our products.